A student athlete, playing at the college or even high school level has a lot riding on the ability to play his or her sport. Dreams of future professional careers and signing bonuses can come crumbling down in a split second because of an injury on or off the field. 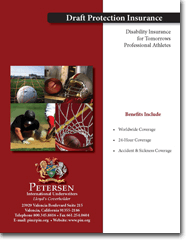 For cases like this, Petersen International Underwriters offers Draft Protection Disability insurance. This plan can be purchased by a student athlete who shows professional potential. In the event of a career ending injury or permanent total disablement, this plan will protect the student against a loss of future earnings as a professional athlete. For a student athlete, disability insurance guarantees that an injury will not cause future fiscal losses. A third party scout will assess the student athlete and determine whether or not he or she demonstrates professional potential. PIU’s sports underwriters will then establish the insured’s benefit amount. The maximum benefit amount that a player can qualify for is based on where he/she is projected to be drafted and how much that position has signed for in previous year’s drafts. In the unfortunate event that the insured does become disabled, the benefit will be paid as a onetime, tax-free, lump sum. Athletes playing at the high school or college level are exposed to countless possible injuries. Additionally, the physical qualifications they must maintain are incredibly demanding. Because the risk is so high, traditional insurance companies usually do not underwrite disability insurance plans for athletes. Petersen International Underwriters provides high limit coverage for high school and collegiate stars planning to play professionally. For more information and answers to common questions please download the brochure.